It’s important to teach your dog to Drop It, or the Release command, for your safety, as well as your dog’s safety. If you don’t see your dog pick up a potentially dangerous item, thus being too late to give the Leave It command, you can tell your dog to Drop It. Too many people, myself included, have been bitten trying to fish a dangerous item out of their dog’s mouth. It’s also great for play time with dogs who like to turn fetch into tug of war, or catch me if you can. 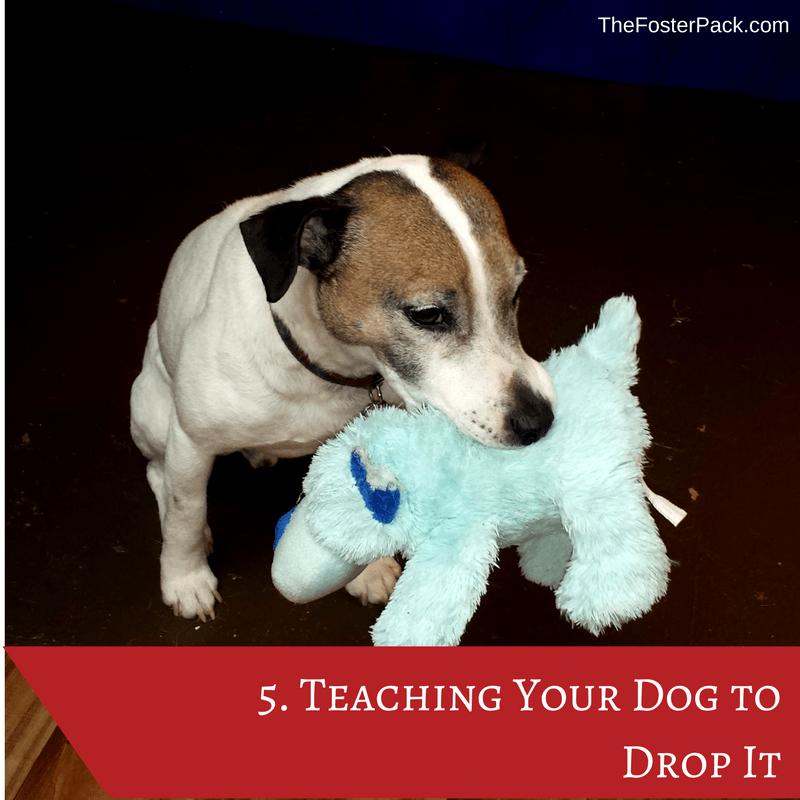 Teaching your dog to Drop It, is one of the simpler commands, for most dogs. Especially if they’ve already learned the Leave It command. Unfortunately, it’s a command a lot of new dog owners don’t think about. Again, myself included. How to teach your dog to Drop It. To get started you’ll, of course, need some [amazon_textlink asin=’B0007A0AQM’ text=’high value training treats’ template=’ProductLink’ store=’fosterpack-20′ marketplace=’US’ link_id=’69f2e44e-4cd9-11e8-ae55-ed56ecd7236f’]. Most dogs are very food motivated, so treats are always a good training device. It gets their attention, and for most dogs, keeps it. You’ll also need an item to Drop. A favorite toy works well. As it’s got to be something your dog wants to pick up. The basic idea behind the Drop It command, in dog training, is to offer your dog a trade. The item he has, for the treat you offer him. To teach your dog to Drop It, you start by offering him the favored toy, and getting him to take it. If he knows the Take It command, it’s a great starting point, if not you can work on that at the same time. Sometimes he’ll want to play with his toy for a few minutes before you start. It’s okay to let him. Just don’t let him get bored with the toy before you begin. Once you’re ready to begin the training, hold up a treat, while the dog still has the toy in his mouth. As soon as he drops the toy, say “Drop It” and immediately give him the treat. If he doesn’t drop the toy when the treat is presented, either switch to a higher value treat, or try holding it closer to his nose. Whatever you do, don’t try to remove the toy from his mouth yourself. Repeat a few times for practice. As he gets the hang of it, gradually hold the treat further and further from him. This is a great command to practice anytime you see your dog holding something.